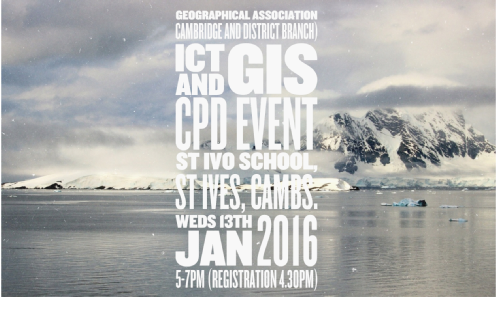 St Ivo Geography Department are proud to be hosting an ICT / GIS event for local secondary school geography teachers in conjunction with the GA Cambridge and District Branch. Course Date and Location - St Ivo School, St Ives - Wednesday 13th January 2015 (5-7pm - registration from 4.30). This evening will begin with a short introduction to ideas using new technologies in teaching geography, from the use of twitter through to useful applications for AFL. The main part of the evening though will involve a hands-on introduction to ArcGIS online and how it can be used in the classroom by Jason Sawle - an ESRI UK Education Consultant. With the new GCSE and A Level specifications fast approaching, the need for Geography Departments to become competent in the use of GIS in teaching and learning to ensure it is embedded in schemes of work is pertinent. In the past, a number of barriers to using GIS including access to expensive software and data has been an issue for many of us, being web based however, ArcGIS online makes it much easier to integrate GIS in teaching and learning with students, requiring no install and providing access to lots of maps and data.